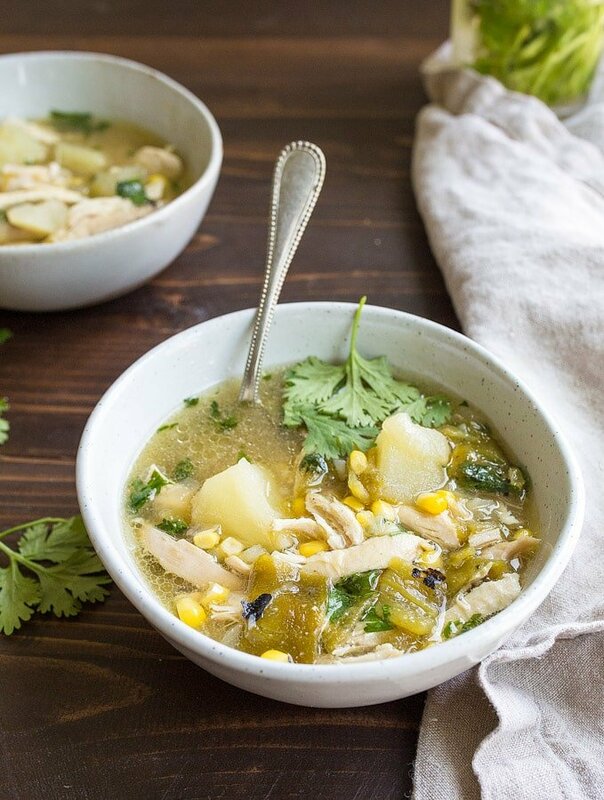 Green Chile Chicken Stew with potatoes, corn, and fresh Hatch green chiles! On the long list of reasons I was so excited to move back to my home state of Texas, ‘food’ was quite high. And somewhere, underneath the subheading of food, ‘Hatch green chile season’ found its place. While Hatch chiles come from New Mexico, Texas imports a fair share of them, as we are known to love our chiles. Green chile chicken enchiladas for two, anyone? When my parents told me that Central Market was hosting their annual Hatch chile fest, and the giant rotating drum roasters were in full-force, I grabbed my husband and daughter to see the sights. And to eat them, too! After green chile cheeseburgers, green chile quesadillas, green chile queso, and green chile Po’ boys, they see the light. Welcome my toddler and husband, two new chile heads, to the club, please. Hatch green chiles are worth celebrating each year. I bought two one-pound packages of the roasted ones, and shoved green chiles into almost everything we had for dinner last week. While stirring green chiles into my macaroni and cheese recipe is great, this green chile chicken stew is where it’s at. I should mention that I buy the green chiles labeled ‘mild,’ but if hot ones are more your style, go for it! I’m having trouble convincing a 3-year old to eat hot foods, but I guess I should be more patient. 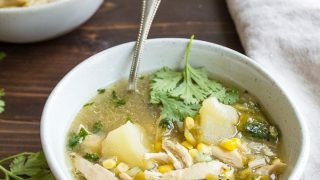 This green chile chicken stew is so good that I will make it with canned green chiles when the Hatch ones aren’t in season. Serve it with a small batch of cornbread, and enjoy it all season long. My chicken stew method comes from Christy Jordan. Her cookbook has a wonderful simple chicken stew with potato chunks, sweet corn kernels, and an excess of freshly ground black pepper. The potatoes lend a starchy creaminess to the stew that lets the rest of the flavors shine through. I adapted her recipe to include green chiles, while leaving out the tomatoes in her original recipe. When you bring home whole roasted green chiles from the store, or if you roast them yourself over a gas flame, you still have a small amount of prep work to do. I know that this is much more labor-intensive and messy than buying canned green chiles, but I promise that the fresh flavor is so worth it! First, use the back of a knife to scrape off the black skin. Try to get most of it off, but don’t worry about a few black flecks here and there. Next, split the chile open and remove the stem and seeds. It’s easiest to do this while rinsing under running water, but I don’t actually do this because I don’t want to wash off the roasted flavor. Use a paper towel to grab tear the stem out and grab the seeds instead. That’s it! 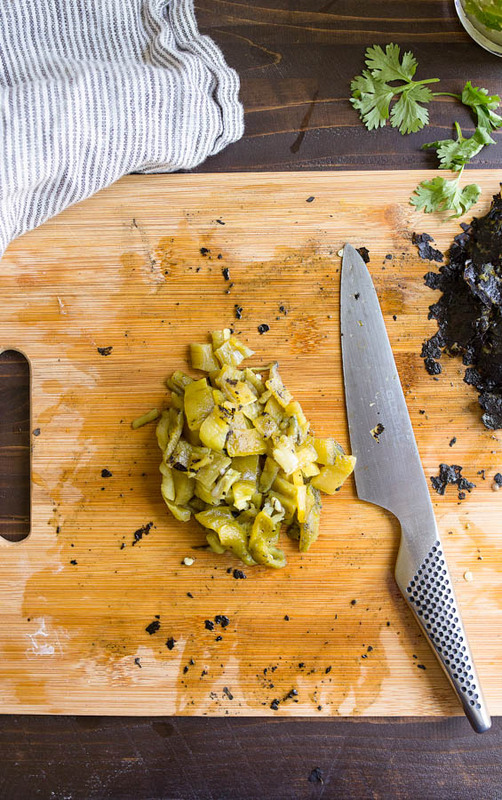 Now you’re ready to chop the chiles and use them in any recipe that calls for them. Also, if you buy slightly more fresh green chiles than you need, they freeze best already roasted and cleaned in this way. I divide up my clean chopped roasted chiles into 4-ounce portions (because most recipes call for as 4-ounce cans), and seal them in my Food Saver for using the rest of the year. I know that it might still be summer weather where you live, but please save this recipe for Fall. It’s a great recipe to double (or triple), and serve on Game Day! No cream green chile chicken stew. 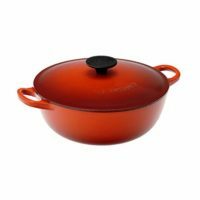 In a small 3-quart soup pot, heat the oil over medium-high heat. Add the onion to the pot, and cook while stirring occasionally until softened and starting to turn golden brown on the edges, about 5 minutes. Next, stir in the minced garlic and cook for 30 seconds. Add the chicken broth, salt, pepper, chopped potatoes, and green chiles to the pot. Bring the mixture to a simmer. Add the chicken breast (whole), cover and let cook until it's done, about 15 minutes. Remove the chicken to a cutting board, and use two forks to shred the meat. Add it back to the pot. Stir in the frozen corn and let everything cook on a gentle simmer for about 5 more minutes. 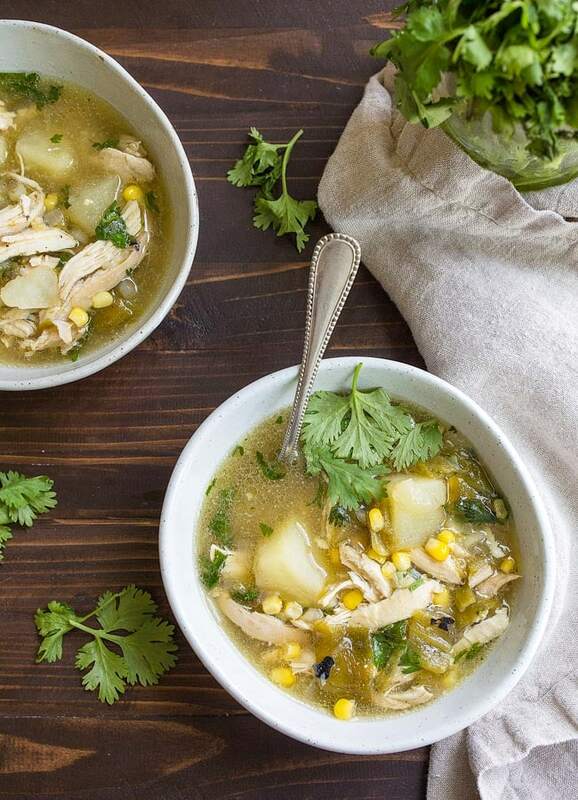 Divide between two soup bowls, and serve garnished with fresh cilantro and lime wedges. *The chiles should already be cleaned, peeled and diced here. 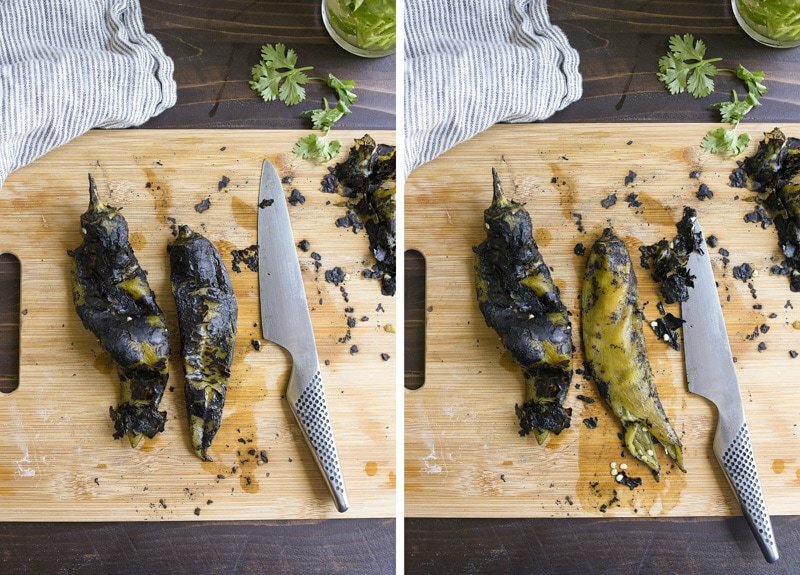 Refer to post for directions on how to clean your chiles if they're whole after being roasted. 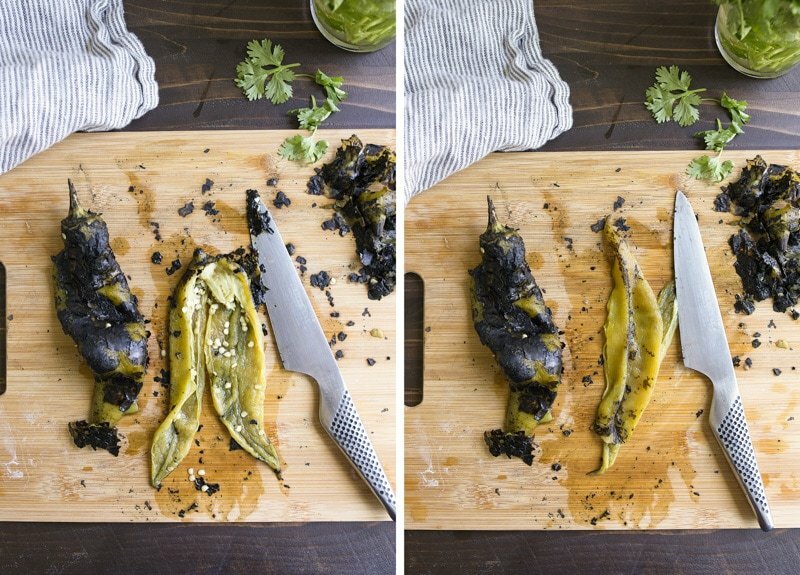 If you're not using fresh chiles, use two 4-ounce cans of fire-roasted diced green chiles. I cannot wait to try this as I just moved to Austin 2 weeks ago!!! Leaving some of the blackened skin on only adds to the depth of flavor. We get a 25# box about every other year (and there’s only 2 of us home now). Will be trying this soon – it’s getting chilly here in Southern Colorado! I know this will be yummy with your Small Batch Dinner Rolls.. I need to adapt this to my Instant Pot..
Just made this in the instant pot with NM hatch chili. So yummy! Living in NM, my freezer is always stocked with fresh roasted hatch green chile! I buy the chile roasted and bag it in individual quart size freezer bags with the skin on. It is too time consuming to remove the skin and can burn your skin. When I need a bag (or two), I pull it from the freezer and run the chiles under warm water. The skin comes right off. this soup looks very good I think I am going to try it, thank you for sharing your recipe. Living in the Hatch area, I’ve always felt blessed to have this delicious food within my grasp. 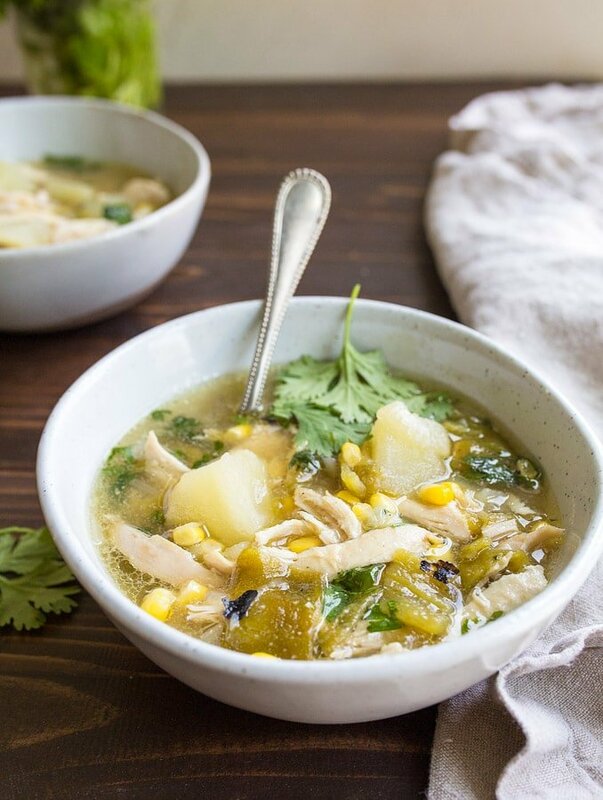 The aforementioned green chili chicken stew is a fall winter staple in our family menu. If you have the chance, substitute elk. Mescalero is close by and we throughly enjoy our elk green chili stew. Hi: Love your recipe! I’m definitely going to try it. I’m from New Mexico and miss my fresh Hatch green chiles when they’re not in season. My recommendation to easily clean freshly roasted chiles is to place them in a ziploc or plastic bag, tie/close it up and let the steam do the work for you. After about 5 to 10 minutes, you should be able to scrape off the skins without any issues. 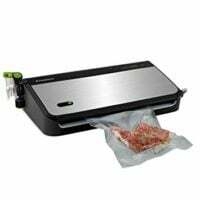 I usually grab a paper towel and simply wipe off the skins after they’ve steamed for a bit. Saves me the hassle of having to scrape with a knife and leaves most of the chile intact for use in recipes. Also, recommend people wear gloves if the chiles are hot and don’t dare touch your face or eyes before washing your hands. What a great tip, thanks so much! Made this again today, in my IP..
What, no mention, of the smell of these lovelies while they are roasting tumbler. It is the first sign of fall for me. We got 20 lbs roasted this past fall and we are still using them. This may be my recipe for this cold weekend coming up.